The Lunar Module known as Spider shown still attached to the Saturn IVB stage in earth orbit prior to docking with Apollo 9's Command/Service module known as Gumdrop on March 3, 1969. In this historical photo from the U.S. space agency, the Lunar Module “Spider,” remains attached to the Saturn IVB stage in earth orbit prior to docking with Apollo 9’s Command/Service Module, “Gumdrop.” The photo was taken following separation of the CSM from the S-IVB stage, and the Spacecraft Lunar Module Adapter (SLA) panels have already been jettisoned. Following a March 3, 1969 launch, Apollo 9’s crew of James McDivitt, Dave Scott, and Rusty Schweickart spent 10 days testing the Lunar Module and Command and Service Modules in Earth orbit. 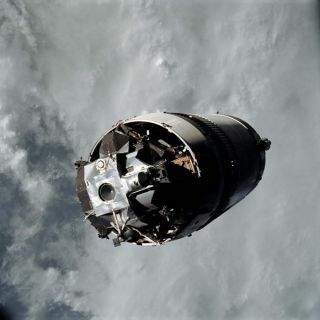 Apollo 9 was the first mission to dock the CSM with the LEM, and the astronauts paved the way for subsequent flights to the moon with the CSM and the LEM.